If you've been following CES you might think the entire technology industry is making tablets, but no – some firms are doing much nuttier things than sawing the keyboards off laptops. We have robot deer, robot staff, modern-day alchemy, thought-controlled games and an iPhone app that tells you if you're a lady. This year's Consumer Electronics Show has barely begun and we've already found the tech that's hard to top: brain-controlled iPads. As New Scientist reports, Canadian firm Interaxon will be showing off a thought-controlled version of the Zen Bound iPad game at CES this year. Modified headphones can tell when alpha brainwaves increase – due to relaxing – or when beta waves get a boost from intense concentration, and the on-screen action changes accordingly. A thought-controlled FIFA is some way off, although a thought-controlled Wayne Rooney probably isn't too much of a challenge. If you go down to the woods today you're in for a big surprise – especially if you're a poacher. An innocent-looking deer has been created that turns into something considerably less pleasant if you try to shoot her: she's a robot, and she'll mow you down in a hail of lead. And by "mow you down" we mean "sit there while Fish and Wildlife Conservation Officers come and get you". Now, won't someone invent robo-cheese that catches midnight fridge raiders? Some of the brightest minds in the world use technology to discover new ways of treating the world's ills, or to understand what it is to be human. 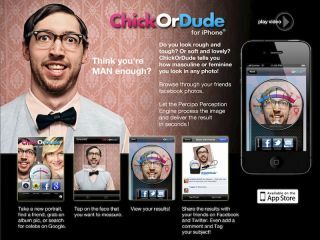 Others invent ChickOrDude, the iPhone app that – yes! – can tell you if you look like a chick or a dude. The app is a fun application of serious technology: creators Percipo have developed algorithms that can assess and recognise faces in much the same way that we do, and they reckon such algorithms will play a big part in the future of computing by enabling smartphones and other gadgets to make sense of the world around them. And ChickOrDude? "A litmus test of whether technologies are ready for mass adoption is if one can build useful, consumer-facing products using them," Percipo says. The problem with precious metals such as palladium is that they're precious – in other words, they're hard to get hold of. Hurrah, then, for the Kyoto University team that invented a kind of alchemy to create something awfully like the in-demand metal Palladium. The trick? Nanotechnology that persuades rhodium and silver to get together, something that's usually exceptionally difficult to do. That's good news for everyone because palladium's used in all kinds of things from catalytic converters to mobile phones and fuel cells. If you ever wished waiters were a bit more robot-y, the Dalu Robot restaurant in Jinan, China has got news for you. Its staff includes more than a dozen robot waiters, which look like a cross between C-3PO and Top Gear's Stig. As Time reports: "The robots whir around the room on little bicycles carrying meat and veggies to be dipped by restaurant-goers into bubbling broth… every bot is equipped with motion sensors; all you have to do is get in one's way and nab a plate of food." Equally rubbish sounding is the welcome bot ("a female-looking bot with fake fluttering lashes stands at the door to welcome diners… in a soothing monotone") and the entertainment bot ("clad in a dress, [it] flails its arms about"). Maybe we'll stick to McDonalds.